Okay, so you've heard that Vitamin C Serum is a must have in your skincare routine for building collagen, correcting skin damage from the environment and improving an even skin tone. 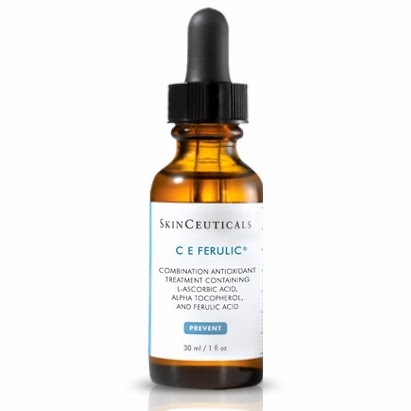 Why does SkinCeuticals have to complicate it by putting other ingredients in their Vitamin C, calling it CE Ferulic? The importance of Ferulic lies in how powerful it is, much more effective than other antioxidants. Found in the walls of plant cells of apples, coffee, oranges, peanuts and many more, ferulic is an antioxidant that is more powerful than Vitamin C and E. Studies have found when ferulic is combined with Vitamin C and E, it makes the Vitamins more powerful. Amazingly, ultraviolet light makes ferulic even more powerful. Antioxidants repair oxidation damage to cells and DNA from environmental factors such as sun, pollution, and everything we come into contact with in our daily life. Oxidation is natural like the browning of a cut apple, and you body naturally metabolizes oxygen throughout the day very effectively. However a small percentage of cells will be adversly affected, having an electron robbed and sending the newly formed free radical cell on a hunt for another cell to rob. Sometimes this causes injury to the cell another cell from causing a chain reaction of destruction and decomposing of cells and DNA. Antioxidants neutralize free radicals by either preventing the free radical chain reaction from starting, like Vitamin C, or breaking the chain reaction of damage like Vitamin E. Each antioxidant helps to prevent the free radical damage in different ways, so a broad range of antioxidants in your skin care and diet are beneficial. Ferulic neutrilizes a certain type of free radical, hydroxyl radical, superoxide and superoxide. SkinCeuticals CE Ferulic is formulated with Vitamin C (15%), Vitamin E (1%) and Ferulic Acid (0.5%), and this concentration is patented. With 3 powerful antioxidants it helps to prevent, stop and neutralize the free radical damage in many ways, each antioxidant working together to be more powerful together.